Boating The boat ramp at Dinah's Landing on the west side of Goose Creek is conveniently located near the river. Motorboating, sailing and windsurfing are popular activities. Boating regulations of the NC Wildlife Resources Commission apply. Camping A primitive family campground is located between Goose and Flatty creeks. Twelve well-spaced tent sites amid large pines draped in Spanish moss include tables and grills. Toilet facilities and water are available nearby. Sites are available on a first-come basis for a fee. Education and events Rangers hold regularly scheduled educational and interpretive programs about Goose Creek State Park. Exhibits and educational facilities Goose Creek State Park has the right tools to open your eyes to world of wetland nature! Explore the natural side of Goose Creek at the park's Environmental Education and Visitor Center. 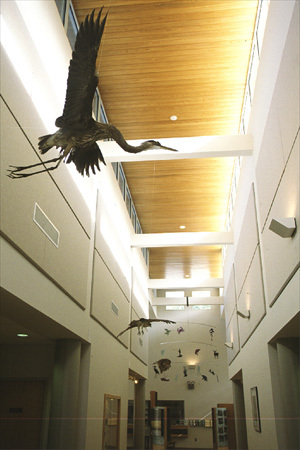 Visitors are greeted with animal mounts and interactive wetland exhibits as soon as they enter the lobby. In addition, a five-minute film is available to introduce visitors to the park and its creatures. Explore the center further, and enter the Discovery Room where visitors can learn even more about animals that live in the wetlands. Aquariums are set up to simulate a hardwood swamp and brackish marsh. Mounts, replicas and animal signs, both on tabletops and in pullout drawers, allow close-up study and encourage hands-on learning. The Discovery Room also has a bird observation station, a table with an excellent view of the bird feeder outside. Sit down and wait to see which birds stop by. Or, pause by the outside butterfly garden to view another winged creature of the park. Educational facilities available for groups include a resource room with computers and a variety of field guides and other materials that unlock the door to environmental education. A wet lab with microscopes and video projection equipment allows visitors to study water samples collected from the park. Enjoy a screened outdoor classroom, a short walk from the center, that offers classroom comfort among the towering trees of a mixed hardwood forest. Or, watch one of the park's nature films in the auditorium. The opportunities for learning at Goose Creek State Park are abundant. Fishing Fish in the creek or the river; both have plenty of fresh and saltwater fish, especially in warmer weather. Species include largemouth bass, bluegill, and white and yellow perch. A state fishing license is required; the rules of the NC Wildlife Resources Commission apply. Hiking Flatty Creek Trail  Enter this one-mile loop from the parking area at the campground entrance. Boardwalks across freshwater and brackish-water wetlands lead to an elevated observation deck. Goose Creek Trail  This 1.9-mile, one-way trail from the picnic area to the camping area exhibits the beauty of the cypress swamp. Ivey Gut Trail  Travel the length of this two-mile, one-way trail from the main park road to the campground. Or, enter the shorter Ivey Gut Loop Trail from the camping area. Both provide views of Upper Goose Creek. Live Oak Trail, Cemetery Loop  This .4-mile loop follows the shoreline of the Pamlico River from the swim beach and then turns and passes a cemetery dating from the 1880s. Palmetto Boardwalk Trail  The Environmental Education Center and the Ivey Gut parking area are connected by this .7-mile, one-way trail, which is handicapped accessible. 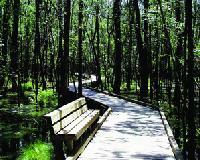 Enjoy the beauty and wildlife viewing opportunities of a hardwood swamp. Mallard Creek Trail  This 1.26-mile loop originates at the last parking lot at the end of the park road. A creek overlook provides a close-up view of a freshwater marsh. And, for a beautiful view of brackish marsh, take time to visit the Pamlico River overlook. Picnicking Picnic tables make the area a pleasant spot for lunch or dinner after a refreshing swim. In the midst of a pine/oak forest, picnic tables, grills and running water supply all the necessities for outdoor dining. Two shelters offer five tables each, and additional picnic tables are available at the swim beach. Swimming Follow a short path from the parking lot to the designated swimming area. A sandy beach offers access to the cool waters of the Pamlico River.